Generations of family and close friends surprised Giovanni's Coast Village Road owner Albert Noormand (center) on Wednesday night to celebrate 32 years of business. The restaurant will close in January 2019 when their lease is up and not being renewed. On Wednesday evening, Albert Noormand was happily surprised but didn’t immediately understand why so many friends and family were coming into his pizzeria on Coast Village Road. 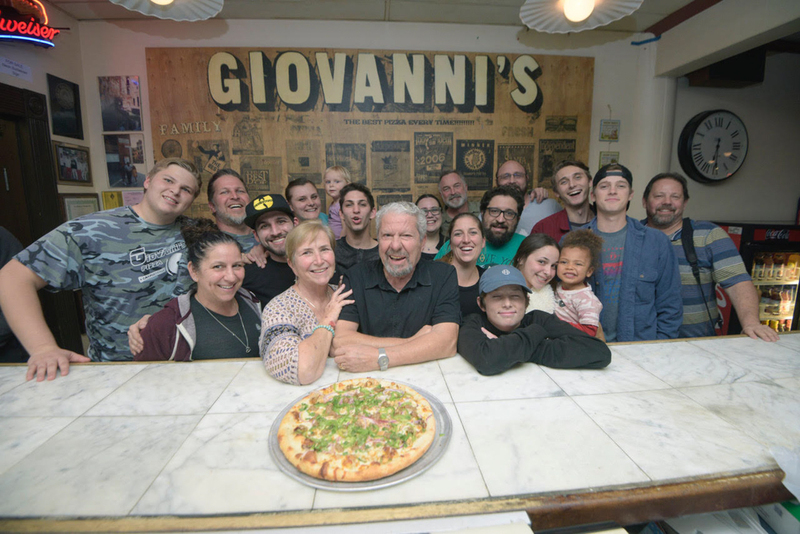 His four grown children and many grandchildren had secretly planned an event to celebrate the long history of Giovanni’s Pizza. Albert’s son Shawn, who owns the Carpinteria namesake eatery, showed up with his sons and joined other family members in the kitchen to help with the sudden rush. Noormand, owner and one of the original founders of Giovanni’s Pizza, has been looking for a new location since hearing that his lease would not be renewed in 2019. He’d been told the landlord is looking for a more upscale venue. Technically in the City of Santa Barbara but known as the Montecito location, the family-style restaurant that opened in 1986 will shut its doors for good in about a month to be out by the January 30 lease deadline.